I have my fingers in a lot of pots right now, and I am currently working on another shawl/shawlette for my niece, Katie. I tend to make a few things for her each year, but only because she is so cute wearing what I make for her. She is 5 years old, and she is a total fashionista! She loves hot pink and just about any variation of it. So, when I was looking in my stash for the perfect yarn to make this shawlette for her, I came across some Cascade 220 Superwash in hot pink. 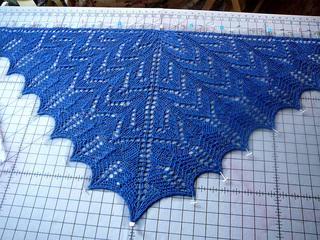 I knew that was the yarn that I was going to use to make this shawlette for her. I will post a few pictures of it soon. I have had to frog it completely because I didn’t follow the chart correctly. I knew that the shawlette wasn’t showing the lace correctly. I just didn’t know why and I could not seem to figure it out. Off to the yarn store I went. Where else would you get help from when you can’t figure out something in a pattern, right? I talked to the resident knitting/weaving/spinning guru, Rachel, at my favorite yarn store, Yarn Tree Studio in Raleigh, NC. Let me give a shout out to Lynn and Rachel over there! Rachel showed me how to read a lace pattern correctly. See, I thought that you would work across the row from right to left and then return to the right and work the pattern repeat box until you got through with the yarn on your needles. WRONG! She explained that you work through the row from right to left; however, when you get to the center stitch, you would simply go back across the row from left to right because you want the shawl to mirror what you did on the right side of the shawl! Talk about a light bulb moment for me! DUH! So, I took it all out last night and started it over so that this time the stitch counts would be right, and everything would mirror each other and look like the pictures here. These pictures are from http://www.ravelry.com and they belong to the the original designer. I am only posting them here as a reference point so that when I post my pics of my shawl for Katie, my readers will be able to see how it should look vs. how it really looks. I hope that it turns out okay. It is a fairly quick knit, at least it is right now because I don’t have that many stitches to work across. By the time I am finished, there will be approximately 139 stitches on my needles and that may take a minute or 2 to work across. 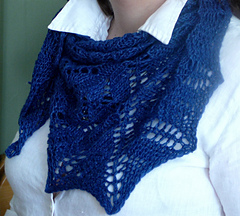 I am making this for Katie so that she can wear it like a shawl now while she is little, and as she grows up into a young woman, she will be able to wear it as the designer intended, like a shawlette, so that means that she can wear this for most of her life if she wants to. Originally, I was going to use Malabrigo yarn to make the shawl and I had this beautiful hank of pinks that I was working with, BUT there wasn’t any hot pink in this hank so I frogged it and I went with the Cascade 220 Superwash that was all hot pink instead. Let’s see, that makes 3 times I have frogged this pattern to start over. By the time I am done, I will know this pattern inside out and all around!